The 66th Academy Awards ceremony, organized by the Academy of Motion Picture Arts and Sciences (AMPAS), honored films released in 1993 and took place on March 21, 1994, at the Dorothy Chandler Pavilion in Los Angeles beginning at 6:00 p.m. PST / 9:00 p.m. EST. During the ceremony, AMPAS presented Academy Awards (commonly referred to as Oscars) in 23 categories. The ceremony, televised in the United States by ABC, was produced by Gil Cates and directed by Jeff Margolis. Actress Whoopi Goldberg hosted the show for the first time. Nearly a month earlier in a ceremony held at The Beverly Hilton in Beverly Hills, California on February 26, the Academy Awards for Technical Achievement were presented by host Laura Dern. Schindler's List won seven awards, including Best Picture and Best Director for Steven Spielberg. Other winners included Jurassic Park and The Piano with three awards each, Philadelphia with two awards, and The Age of Innocence, Belle Epoque, Defending Our Lives, The Fugitive, I Am a Promise: The Children of Stanton Elementary School, Mrs. Doubtfire, Schwarzfahrer and The Wrong Trousers with one. The telecast was watched by more than 46 million viewers in the United States. The nominees for the 66th Academy Awards were announced on February 9, 1994, at the Samuel Goldwyn Theater in Beverly Hills, California, by Academy president Arthur Hiller, and actress Christine Lahti. Schindler's List led all nominees with twelve nominations; The Piano and The Remains of the Day tied for second with eight. The winners were announced during the awards ceremony on March 21, 1994. Best Director nominee Jane Campion was the second woman to be nominated in that category. 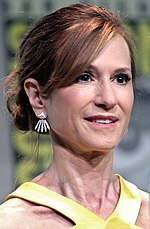 Holly Hunter and Emma Thompson's nominations in both lead and supporting acting categories marked the first and so far only occurrence that two performers earned double acting nominations in the same year. Best Supporting Actress winner Anna Paquin, at age 11, became the second youngest winner of a competitive acting Oscar, behind Tatum O'Neal, who won at age 10 for Paper Moon. Johnny Depp Introducer of the performance of Best Original Song nominee "Philadelphia"
Antonio Banderas Introducer of the performance of Best Original Song nominee "Streets of Philadelphia"
Whoopi Goldberg hosted the 66th Academy Awards. Due the negative reception received from the preceding year's ceremony, actor Billy Crystal announced that after overseeing four consecutive Oscar ceremonies, he would not be hosting the 1994 telecast. In a statement released by his publicist, he stated, "After three Grammys, four Oscars and six Comic Reliefs, I'm going to take a break from my hosting duties. I always felt honored to host the show and did my best to carry on the tradition of Bob Hope and Johnny Carson. I hope the new host has as good a time as I did." With Crystal absent to host the Oscars, many media outlets wondered whom producer Gil Cates would hire to emcee the program. Film columnist Jack Matthews suggested that actor Tom Hanks, who would eventually win Best Actor for Philadelphia, should host the show writing that he "has charm, dignity, wit, intelligence and, it's worth mentioning, he's a movie star!" Cates also offered the role to performers Steve Martin, Bette Midler, and Johnny Carson, but they all turned down the opportunity. After several days of speculation, Cates announced that he hired Oscar-winning actress and comedian Whoopi Goldberg to host the festivities for the first time. By virtue of her selection, Goldberg became both the first African American to host as well as the first woman to host the telecast solo. In an interview with the Los Angeles Times, Cates explained the decision to hire her saying, "She is a highly recognizable star who has millions of fans." He also addressed the media's concerns regarding Goldberg's raunchy and outspoken humor stating, "Some people may think she's potentially dangerous, and she says things that come to her mind. It's going to be exciting for me. The main thing is she wants to do it and she's smart. Whatever she says will be appropriate." Goldberg expressed that she was thrilled to be selected to emcee the 1994 ceremony commenting, "To go from watching to winning to hosting in one lifetime is major." As with previous ceremonies he produced, Cates centered the show around a theme. This year, he christened the show with the theme "People Behind the Camera" commenting that "It will be a salute to those unseen men and women who make what we see on the screen, the artist and craftspeople responsible for the magic of the movies." In tandem with the theme, the ceremony's opening number featured a montage produced by Chuck Workman saluting the many individuals such as directors, editors, and composers who are involved in moviemaking. During that segment, singer Bernadette Peters performing a modified version of Stephen Sondheim's song "Putting It Together" from his musical Sunday in the Park with George. Filmmaker and editor Carol A. Streit assembled another montage featuring a salute to the work of cinematographers and their contributions to film. Several other people and elements were also involved with the production of the ceremony. Production designer Roy Christopher designed a new stage for the ceremony which prominently featured five giant Oscar statues each flanked inside metal cones that were illuminated recurrently throughout the show. Film composer and musician Bill Conti served as musical director of the ceremony. Dancer Debbie Allen choreographed a dancer number showcasing the Best Original Score nominees featuring eight prestigious ballet and dance troupes from around the world. At the time of the nominations announcement on February 9, the combined gross of the five Best Picture nominees at the US box office was $261 million, with an average of $52.2 million per film. 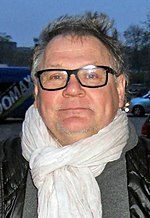 The Fugitive was the highest earner among the Best Picture nominees with $179 million in domestic box office receipts. The film was followed by Schindler's List ($29.6 million), The Piano ($25.7 million), The Remains of the Day ($19.5 million), and finally In the Name of the Father ($6.5 million). Of the top 50 grossing movies of the year, 36 nominations went to 14 films on the list. Only The Fugitive (3rd), The Firm (4th), Sleepless in Seattle (6th), In the Line of Fire (7th), Dave (13th), Philadelphia (29th), What's Love Got to Do With It (38th), and The Age of Innocence (49th) were nominated for directing, acting, screenwriting, or Best Picture. The other top 50 box office hits that earned nominations were Jurassic Park (1st), Mrs. Doubtfire (2nd), Cliffhanger (9th), The Nightmare Before Christmas (24th), Addams Family Values (25th), and Beethoven's 2nd (27th). The show received a positive reception from most media publications. The New York Times film critic Janet Maslin raved that the telecast had "less silliness and less small talk, with more emphasis on cleverly chosen film clips and the bona fide Hollywood magic being celebrated." She also praised host Goldberg saying that she "sustained a tone of levity, which became particularly important as the sweep by Schindler's List threatened to bring out great ponderousness in some quarters." Pittsburgh Post-Gazette television critic Robert Bianco commended Goldberg's performance writing that "She never acted like she was too smart or to hip for the show she was hosting; she never smirked like there was a joke she alone was cool enough to get." He also extolled producer Cates by commenting, "In place of the extraneous jokes and terrible production numbers, he gave us a theme that worked and a generous selection of clips to back it up." Anne Thompson of Entertainment Weekly lauded Goldberg by stating, "Her elegant appearance (at least during the first half), her uncharacteristic restraint (she didn't cuss), and her ability to make it funny (despite the very somber speeches) made the ho-hum telecast worth watching." Some media outlets were more critical of the show. Television critic Howard Rosenberg of the Los Angeles Times lamented that Goldberg's humor "wilted in a blessedly brief 3-hour-and-18-minute telecast." He also wrote that compared with Billy Crystal, her hosting skills were "balmy". Orlando Sentinel film critic Jay Boyar bemoaned that "this year's Oscarcast was only a little more exciting than a wine snob droning on about his favorite vintages." Harold Schindler of The Salt Lake City Tribune remarked that Whoopi's preference for "insider" jokes "left the audience murmuring and most viewers probably scratching their heads." He also added the biggest letdown of the telecast was "Goldberg's seeming ineptness at understanding the moment"
The American telecast on ABC drew in an average of 46.26 million people over its length, which was a 1% increase from the previous year's ceremony. However, the show drew lower Nielsen ratings compared to the previous ceremony with 31.86% of households watching over a 49.28 share. It also drew a lower 18–49 demographic rating with a 19.73 rating over a 40.53 share among viewers in that demographic. In July 1994, the ceremony presentation received seven nominations at the 46th Primetime Emmys. Two months later, the ceremony won one of those nominations for Outstanding Technical Direction/Camera/Video for a Miniseries or Special (Averill Perry, Jim Ralston, Kenneth R. Shapiro, Bill Pope, Hector Ramirez, Larry Heider, Dave Levisohn, Blair White, Bill Philben, Ralph Alcocer, Larry Stenman, Bud Holland, David Irete, Tom Geren, Dale Carlson, David Plakos, Ted Ashton, Jeff Mydoc, Chuck Pharis, Jean M. Mason). The annual In Memoriam tribute was presented by actress Glenn Close. The montage featured an excerpt of the main title of Terms of Endearment composed by Michael Gore. ^ "66th Annual Academy Awards Presentation". The New York Times. The New York Times Company. Archived from the original on January 18, 2014. Retrieved December 5, 2013. ^ "Goldberg To Replace Crystal As Academy Awards Host". Orlando Sentinel. Tribune Publishing. February 7, 1994. Archived from the original on January 3, 2014. Retrieved December 5, 2013. ^ Eller, Claudia (March 22, 1994). "'Schindler's List' Brings Triumph for Spielberg : Movies: Director wins for best picture. Tom Hanks is honored as best actor and Holly Hunter is best actress". Los Angeles Times. Tribune Publishing. Archived from the original on November 1, 2013. Retrieved November 25, 2013. ^ "12 Oscar nominations for 'Schindler's List'". New Straits Times. Media Prima. February 11, 1994. Retrieved December 7, 2013. ^ Fox, David J. (February 10, 1994). 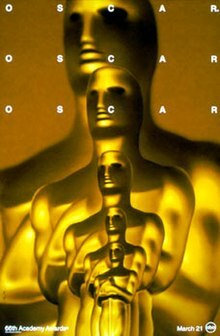 "Oscar's Favorite 'List' : The Nominations : 'Schindler's' Sweeps Up With 12 Nods : 'The Piano' and 'The Remains of the Day' both receive eight nominations; 'Fugitive,' 'In the Name of the Father' earn seven". Los Angeles Times. Tribune Publishing. Archived from the original on December 3, 2013. Retrieved November 25, 2013. ^ Weinraub, Bernard (February 10, 1994). "'Schindler' Nominated for 12 Oscars". The New York Times. The New York Times Company. Archived from the original on October 28, 2014. Retrieved October 22, 2014. ^ Fox, David J. (March 14, 1994). 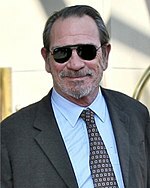 "'Schindler's' Adds a Pair to the List : Awards: Spielberg epic takes more honors--for screenwriting and editing. Jane Campion's 'The Piano' also wins". Los Angeles Times. Tribune Media. Archived from the original on October 24, 2013. Retrieved October 21, 2013. ^ Brennan, Judy (February 11, 1994). "The Hollywood Buzz on Oscar Snubs and Surprises". Los Angeles Times. Tribune Media. Archived from the original on December 18, 2013. Retrieved December 7, 2013. ^ Johnson, Allan (March 29, 1994). "Anna Steals The Show". Chicago Tribune. Tribune Media. Archived from the original on October 21, 2013. Retrieved October 21, 2013. ^ "The 66th Academy Awards (1994) Nominees and Winners". Academy of Motion Picture Arts and Sciences. AMPAS. Archived from the original on July 6, 2011. Retrieved October 22, 2011. ^ Seymour, Gene (March 22, 1994). "Deborah Kerr: An Actress to Remember : Movies: The embodiment of 'perfection, discipline and elegance' finally gets an Oscar, albeit an honorary one". Los Angeles Times. Tribune Publishing. Archived from the original on December 3, 2013. Retrieved November 25, 2013. ^ Speers, W. (January 28, 1994). "Fleet Street Gives Charles The Sweet Treatment". The Philadelphia Inquirer. Philadelphia Media Network. Archived from the original on January 22, 2014. Retrieved December 5, 2013. ^ Fox, David (March 18, 1994). "Shhhh: And the Oscar Presenters Are . . . : Movies: Next to the names of winners, the best-kept Academy Awards night secret has been the show's lineup--until now". Los Angeles Times. Tribune Publishing. Archived from the original on December 4, 2013. Retrieved November 25, 2013. ^ a b Marx, Andy (February 16, 1994). "Springsteen on Oscars". Variety. PMC. Archived from the original on January 2, 2014. Retrieved January 2, 2014. ^ "Company Town Annex". Los Angeles Times. Tribune Publishing. January 21, 1994. Archived from the original on December 18, 2013. Retrieved December 7, 2013. ^ "Billy Crystal Decides Not to Be Oscars Host". The New York Times. The New York Times Company. January 21, 1994. Archived from the original on October 14, 2013. Retrieved December 7, 2013. ^ a b Matthews, Jack (January 22, 1994). "Commentary: Who Will Host the Oscars? It's Not Crystal Clear". Los Angeles Times. Tribune Publishing. Archived from the original on December 18, 2013. Retrieved December 7, 2013. 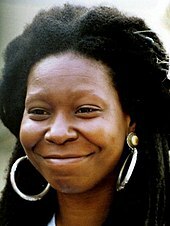 ^ "Whoopi Goldberg To Play Host at Oscars". The New York Times. The New York Times. February 7, 1994. Archived from the original on December 20, 2013. Retrieved December 7, 2013. ^ "Comedian Whoopi Goldberg to Host Oscars". The Gazette. Postmedia Network. February 7, 1994. p. F5. ^ Fox, David J. (February 7, 1994). "Whoopi! There It Is: Goldberg to Host Oscars : Awards: Performer breaks new ground - first woman and first African American as solo master of ceremonies". Los Angeles Times. Tribune Publishing. Archived from the original on December 18, 2013. Retrieved December 7, 2013. ^ Ryan, Desmond (March 20, 1994). "Whoopi pushes the envelope". Austin American-Statesman. Cox Enterprises. p. 7. ^ Marx, Andy (February 6, 1994). "Goldberg set to host Oscarcast". Variety. PMC. Archived from the original on December 16, 2013. Retrieved December 7, 2013. ^ "The 66th Annual Academy Awards Presentation". Hollywood.com. Hollywood.com, LLC. Archived from the original on December 12, 2013. Retrieved December 7, 2013. ^ Welkos, Robert W. (March 21, 1994). "Oscar Time--Without a Safety Net : Welcome to Live TV--When Even Dogs Can Have Their Day". Los Angeles Times. Tribune Publishing. Archived from the original on December 18, 2013. Retrieved December 7, 2013. ^ "Conti to tune Awards". Variety. PMC. January 3, 1994. Archived from the original on January 4, 2014. Retrieved January 3, 2014. ^ a b c "1993 Academy Award Nominations and Winner for Best Picture". Box Office Mojo. Amazon.com. Archived from the original on December 2, 2013. Retrieved November 25, 2013. ^ a b "1993 Domestic Grosses". Box Office Mojo. Amazon.com. Archived from the original on December 2, 2013. Retrieved June 5, 2013. ^ Maslin, Janet (March 23, 1994). "Critic's Notebook; Minus Suspense Factor, Oscars Cut to the Chase". The New York Times. The New York Times Company. Archived from the original on December 19, 2013. Retrieved November 25, 2013. ^ Bianco, Robert (March 22, 1994). "Telecast shines spotlight on movies, not distractions". Pittsburgh Post-Gazette. Crain Communications. Retrieved December 7, 2013. ^ Thompson, Anne (April 1, 1994). "Oscar's List". Entertainment Weekly. Time Warner. Archived from the original on January 1, 2014. Retrieved December 31, 2013. ^ Rosenberg, Howard (March 22, 1994). "Calendar Goes to the Oscars : Whoopi, Better Naughty Than Boring : Awards: Goldberg fails to hit a funny bone or stir up any of the controversy that was hyped the week before the telecast. In fact, her hosting is balmy , particularly compared to predecessor Billy Crystal". Los Angeles Times. Tribune Publishing. Archived from the original on October 22, 2013. Retrieved December 7, 2013. ^ Boyar, Jay (March 25, 1994). "Oscar Show's Rating: Plenty Of Class, Not Much Excitement". Orlando Sentinel. Tribune Publishing. Archived from the original on January 1, 2014. Retrieved December 31, 2013. ^ Schindler, Harold (March 23, 1994). 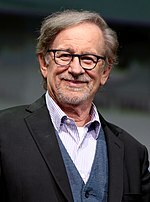 "Spielberg shines at Oscars, but all that gliters isn't Goldberg". The Salt Lake City Tribune. MediaNews Group. ^ Johnson, Greg (March 18, 1999). "Call It the Glamour Bowl". Los Angeles Times. Tribune Publishing. Archived from the original on September 28, 2013. Retrieved August 26, 2013. ^ Gorman, Bill (March 8, 2010). "Academy Awards Averages 41.3 Million Viewers; Most Since 2005". TV by the Numbers. Tribune Media. Archived from the original on March 10, 2010. Retrieved March 12, 2010. ^ "Primetime Emmy Award database". Academy of Television Arts and Sciences. Archived from the original on September 26, 2013. Retrieved October 1, 2013. ^ "Emmy Award Nominations 1994 : Nighttime Nominees: A Complete Rundown". Los Angeles Times. Tribune Publishing. July 22, 1994. Archived from the original on October 15, 2013. Retrieved December 5, 2013. ^ "The 46th Annual Emmy Awards: Who Won What: The List of Winners on TV's Annual Night of Nights". Los Angeles Times. Tribune Publishing. September 12, 1994. Archived from the original on December 24, 2013. Retrieved December 5, 2013.